We have designed and developed theSTANDARDline of AV Conferencing Furniture which includes selections of Lecterns, Credenzas and Tables. We are offering the three most frequently requested table shapes as part of theSTANDARDline Table series; Rectangle, Boat, and the Wedge (Trapezoid) Shape Table Tops. All are available with either Round or Rectangular Pedestal Bases. WEDGE (Trapezoid) Shape tables are available from theSTANDARDline in 12', 14', and 16' lengths. 12' x 36" x 66"
14' x 42" x 72"
16' x 42" x 72"
Our WEDGE Tables are available with Rectangular Pedestal bases, or a Full Wedge base. All pedestal tables come with open support aprons to facilitate cable management .All Bases come with access panels. Pedestal bases are open at the bottom, a clear cable path is provided from the base to the support apron. Ordering is simple. 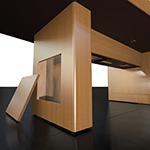 Choose a SHAPE, a SIZE*, and a BASE configuration, then choose Table Top Surface material; wood veneer or plastic laminate. Choose the Wood Species and finish color, Accept the defaults for table edge. Select and indicate quantity of Table Top AV Interfaces and / or microphones, if required. *When selecting a table size, consider providing 30" of table edge per participant. Table orders which include specification for customer provided equipment cut-outs on the Table Top Surface, must either be accompanied by or followed up with customer provided specification sheets or cut-out template(s). Table bases manufactured by Wilcox Woodworks are built with access panels to allow for easy cabling of AV and electrical. Table support aprons are open providing a clear path for routing cables to areas of the table top. All access panels are easy "lift-off" for quick tooless access. Locking panels are available as an option, if required. TheSTANDARDline was developed to provide purchasers a quick and easy vehicle for ordering, eliminating the wait time required for submission and quotes. Full product specification and pricing is available at our DOWNLOADS page. 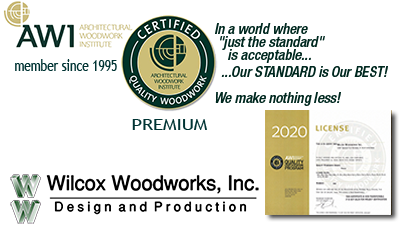 © 2018 Wilcox Woodworks, Inc.